A warm welcome as always to the Railwaymedia blog, this being edition 46. Well, another superb week of weather has coincided with a week of nights at work although this time, unlike the good week in June, I had to do a bit more at work during the night so had less time for photography during the day. 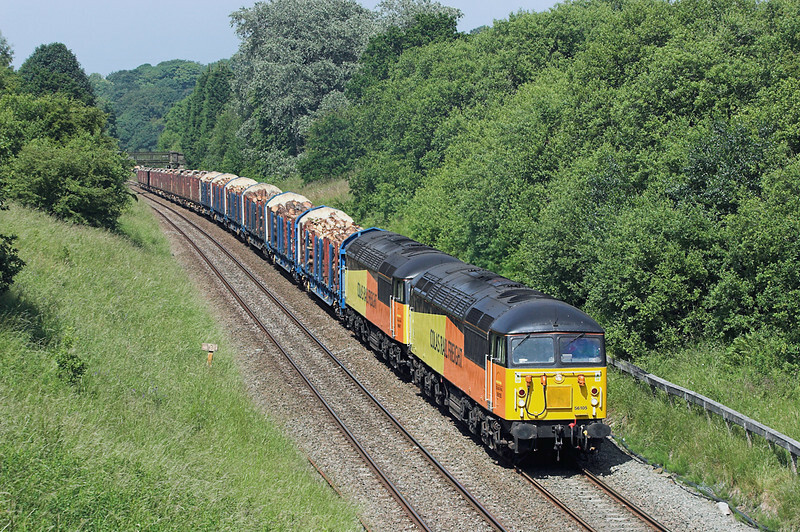 So no long trips, but I did again catch up with some of the local workings; the biggest development has been Colas starting to use double headed class 56's on their Carlisle to Chirk log trains. It did break down on a couple of occasions so they have probably decided that two engines are better than one. Certainly I understand that DRS have found on the Tesco train using two class 66's does not significantly use more fuel than just using one as the extra power means the engines are not being used on full power for as long as they would otherwise be. The timings of the train have changed also over the last few weeks. Previously it left Carlisle about 1200 and ran, usually via the Settle and Carlisle line, but occasionally via the West Coast Main Line. Due to engineering work between Chester and Shrewsbury it has had to arrive at Chirk earlier so has been leaving Carlisle at 1000. The first week or so it ran via Shap but last week it has returned to the Settle and Carlisle line. The revised schedule has meant a change to the locations where it is possible to photograph the train due to the angle of the sun at the earlier time. Anyway, my planned scanning in and processing of bus pictures got put on the back burner as a result of the weather. I spent two days scanning in the prints from one of my many albums but only got 50% through sorting them out. They will have to wait for now! 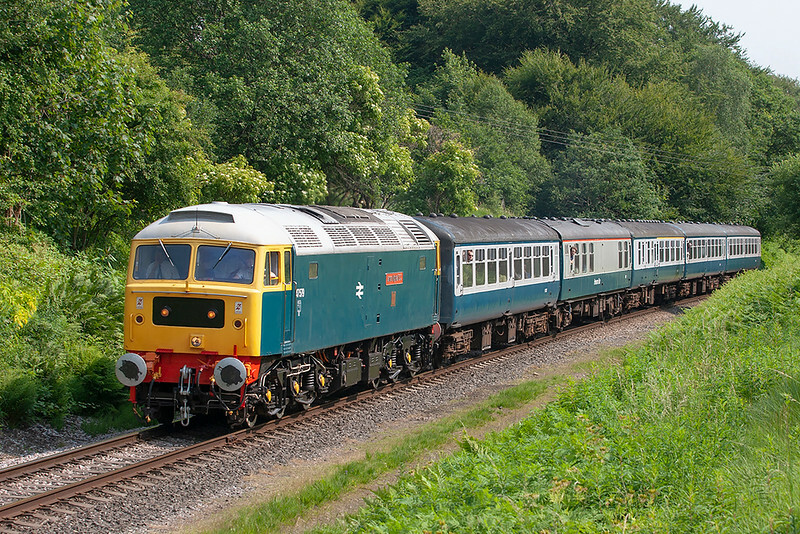 The sun made an appearance for the East Lancashire Railway's Diesel Gala. I went on the Friday (I planned to go Sunday too but had an uncharacteristic hangover!). 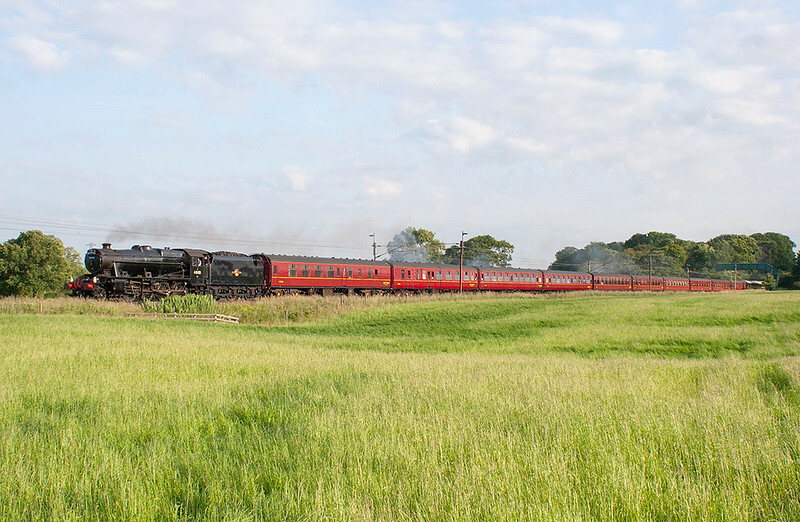 The stars of the gala were the trio of visiting engines from the Mid Norfolk Railway; 47579, 47596 and 73210. The best one for me was BR Blue 47579 on the blue/grey 'shuttle' rake used between Bury and Ramsbottom: the days pictures are HERE. ﻿As mentioned I flunked the Sunday at the ELR but hopefully made up for it this week by spending whenever possible out photographing the local freight workings. Monday was the first day I realised the log train was running earlier, on this occasion via Shap. 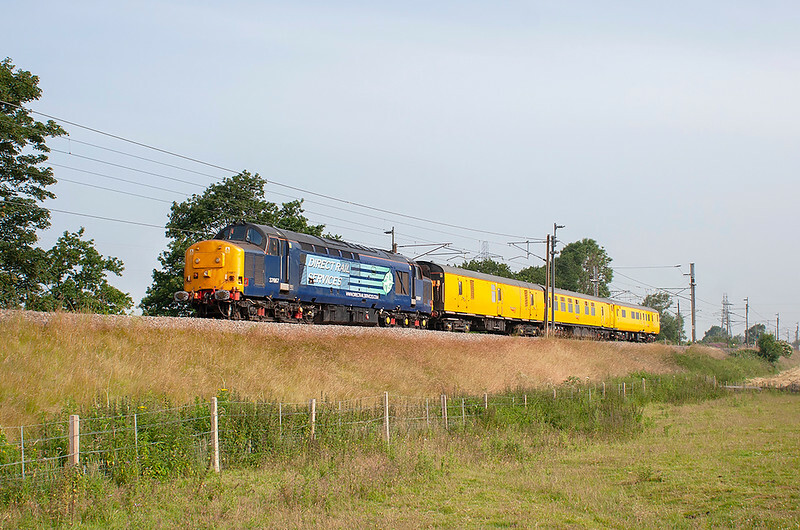 Conveniently it meant it was running ten minutes in front of the regular DRS Mossend to Daventry train so it was worth a drive to Standish near Wigan to photograph the pair. Seeing there was also a West Coast Railways train heading from Southall to Carnforth posed a dilema as the light is generally wrong for northbound workings. 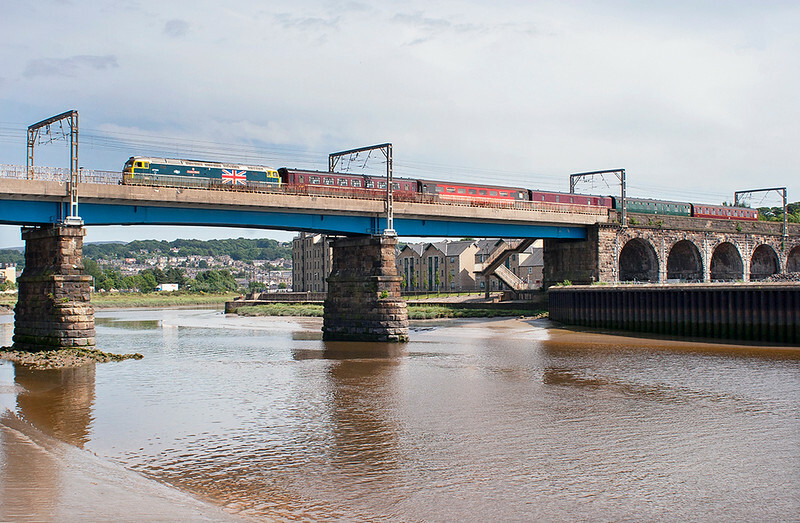 I decided on nipping up the M6 to Lancaster for a shot of it crossing the River Lune. I was expecting a maroon loco and coaches so 47580 with a train that fitted nicely was a pleasant suprise! Finishing work at around 5am for a few days gave me the opportunity to go north from Preston to photograph the early morning departmental train that passes Preston about 0530. Obviously this is only possible at the height of summer. Another regular working usually follows this, this being 6C51 the nuclear flask train from Crewe to Sellafield, however this too this week has been retimed, although unlike the earlier logs this has been running about 2 hours later instead. Wednesday morning I headed to Brock for the departmental train and then waited round for The Fellsman which runs every week during summer. It was starting to cloud over as this came just before 0730 so I decided it was bedtime; I did return in the evening to photograph it on its way back but despite leaving home under blue skies Brock, only about 10 miles away, was under cloud. Had I known though that the working from Kilmarnock to Wembley shown on Real Time Trains was the Virgin 'Pretendolino' being hauled by a DRS class 57 I would have stayed around. Oh well. Thursday started off as a repeat of the previous day with a shot of the first northbound freight at Brock. With nothing of interest then due for 2 hours I nipped home for breakfast before returning for the first southbound daylight train which is the DRS Coatbridge to Daventry 'Russells' train. This was followed 10 minutes later by two WCRC 47s taking a coach to Ardwick depot in Manchester for tyre turning. I then sat on the footbridge over the motorway for 2 hours awaiting two northbound freight workings (the Tesco Express and a nuclear flask train) and Deltic 55022 running light engine to Glasgow Works to haul some EMUs between there and Shields depot for GBRF. Typically, a cloud come over just at the wrong time. 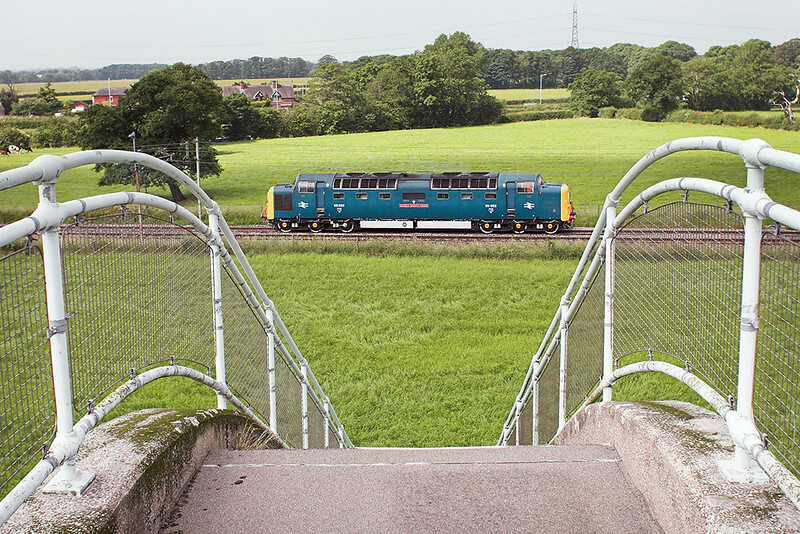 I also managed to spoil the shot by trying to be clever and get an arty shot of it passing the motorway footbridge. I managed in the end to get two shots of it, but each with one nose of the engine obscured by the fencing. Given the picture was a bit of a write-off anyway due to the cloud I had a play around with it in photoshop and have managed to create the shot I was after (minus the sun) by sticking the two images together. I realised I had about an hour to get to Ribblehead to see the log train. I made it easily in the end, in fact I only just missed a preceeding coal train, though you are always at the mercy of slow drivers on the single carriageway roads across from Lancaster to Ingleton. With the 56s being booked to wait for 45 minutes at Hellifield and a further 20 near Clitheroe it was possible to get four pictures in total of this one train; the last time I did any train chasing by car was in Bulgaria! The shot of the day by far was of it near Newsholme, a location not normally doable for this train at its normal time. After a couple of hours at home to have a well needed doze, before work I returned once again to Brock for the class 47's returning from Ardwick. Having spent quite a few hours hanging around Brock already over the previous few days on Friday I decided to try somewhere different for a few morning pictures. 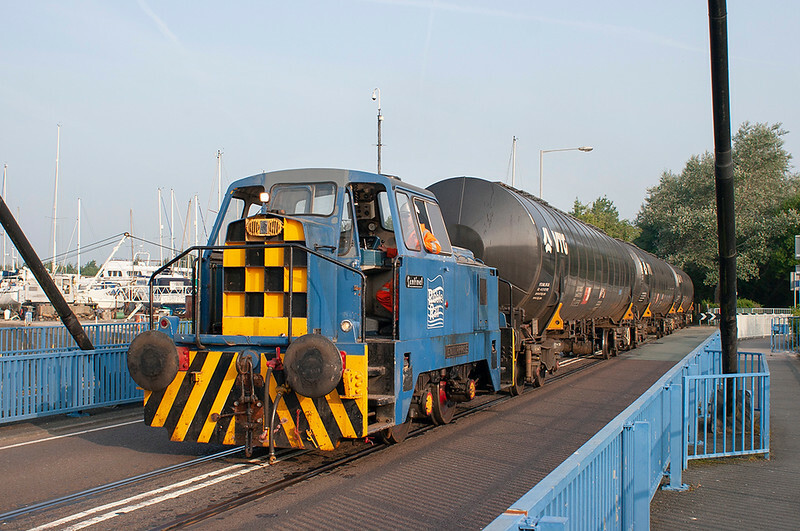 I first went straight from work at 6am to Preston Docks to get a picture of the Ribble Steam Railway's ex-Preston Corporation shunter transferring the bitumen wagons from the siding at Lanfina in the dockland to the exchange sidings for collection by DB Schenker. This train generally runs on Mondays, Wednesdays and Fridays. The move inside the docks happens just before 0700; the shot of it coming across the swing bridge is only of course really possible in summer, indeed even just a few weeks after the equinox the shadow from the control centre begins to cast a shadow on the bridge at just the point where you would want to photograph the engine. I did get this shot a few years ago. It is actually 5 years since I last went for this working so it was good to get a picture of it with the new wagons that have since been introduced. The loaded wagons arrive at the exchange sidings from Immingham about 0730 and are then taken in two halves to Lanfina, the sun is at the wrong angle though for these trips to be photographed. Being bored of Brock I tried a new location for me on the WCML north of Preston at Catterall. It's quite amazing really I can still find these places that I've not done before! There was the promise of the regular DRS southbound freight plus also a test train from Holytown to Crewe. Fortunately the engine was at the right end for this working with the Mk2 driving coach at the rear. Not long after these had past there was the northbound Tesco Express, hauled as always by a pair of DRS class 66s. All week 66429 and 434 had been in charge, the latter being in Malcolm livery. I've not managed to photograph this since it recieved the livery so annoyingly all week it has been the second of the two locos. Despite this being the newest of the DRS class 66s it has managed to carry three different colour schemes in total, starting off in normal DRS livery and then for a time the short lived Jarvis Fastline livery. The company went bust not long after is was repainted for them. There was nothing exciting due in the afternoon so I called it a day after the next freight passed. 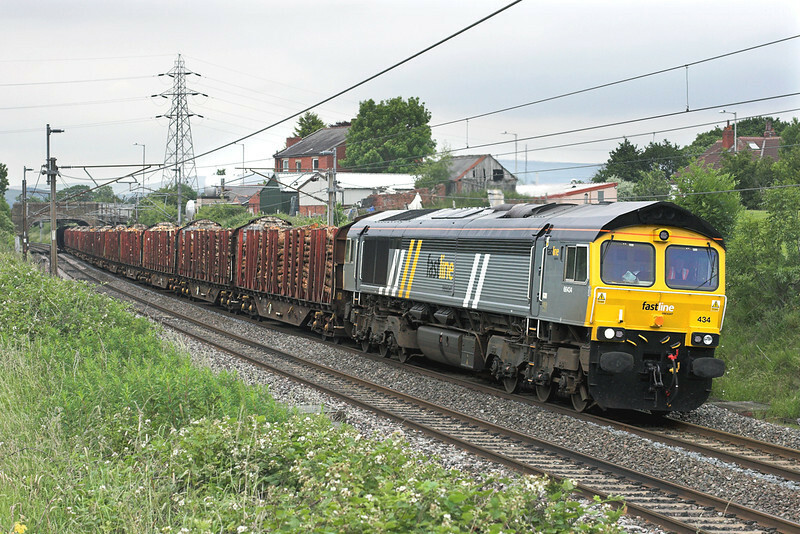 There will be even less freight running through Preston this week due to a 9 day blockage of the mainline between there and Warrington for renewals work on several junctions. Some of the freight, for example the Tesco Express, is being diverted via Chorley and Manchester, others may just not run. 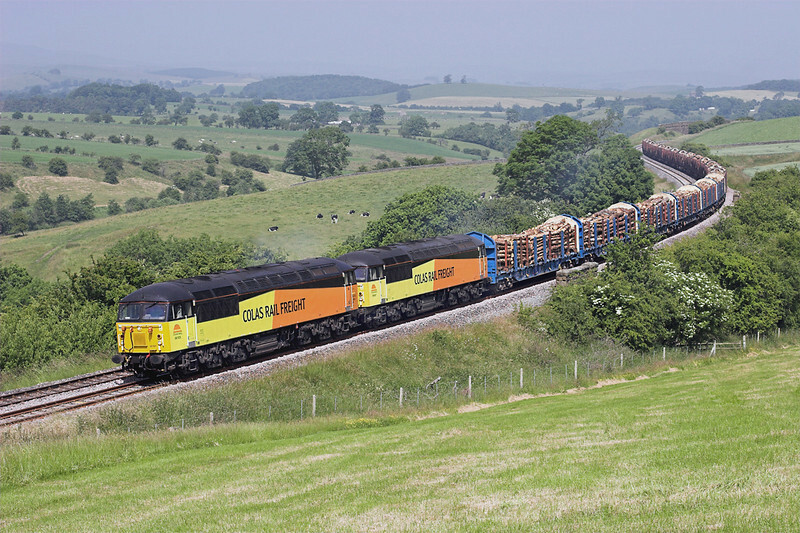 TRUST did have the Colas log train shown as booked that way too but at the time of writing of this Monday morning there is no sign of it running yet on Real Time Trains. 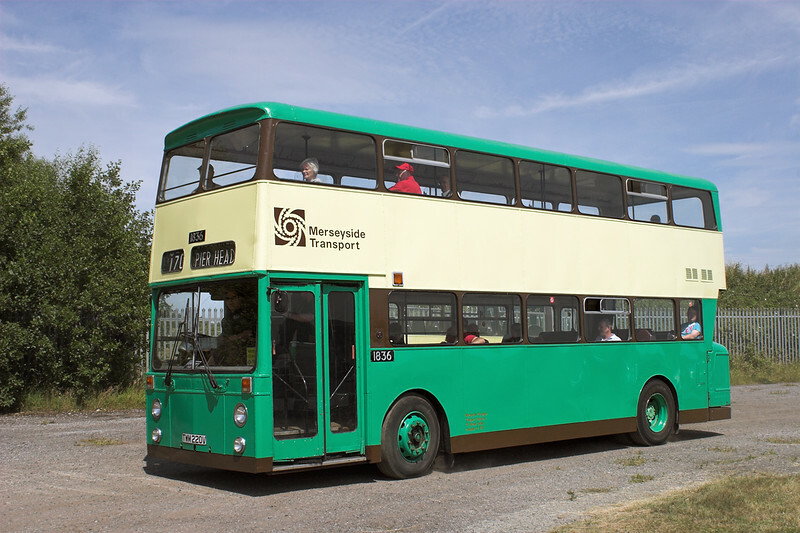 Sunday 14th July marked the second annual open day at the Merseyside Transport Trust near Burscough. Whilst predominately bus orientated, the sole surviving former LMS class 502 EMU was able to be viewed at the rear of the premisis. This former National Railway Museum unit suffered terribly from years in open storage; the Friends of the Class 502 Group are in the long process of restoring this unit and I wish them well with what looks a daunting task. Thanks as always for reading. I'm afraid I am going to have to leave you with a picture of a bus, one of many ex-Merseyside vehicles giving free rides from the MTT's premisis. Next year I will have to make sure I haven't got work in the afternoon so I can spend the day riding round on the routes they provide as a 'Real Ale Trail' round the West Lancashire country pubs! Bye for now.